Yo, Spreadshirt.com was already in the corner of my eye for a long time; You can upload designs and with every purchase you get on your site the extra 'provision' you put on will be send to your bank account. 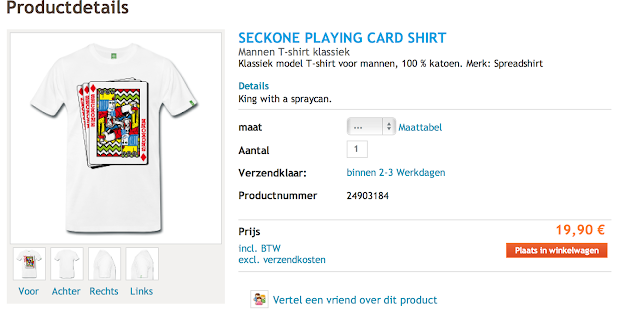 For example, I upload a design for a shirt, and its €17 by itself, I can sell it for €50,-- and the rest is mine. I like that idea haha! The first design is all about the king of the spraycans, its a playing card designed by me and it costs about twenty bucks. Get that stuff! The preview may be a bit pixelated, but I'll buy one myself soon and show it here!